Sadly, whatever else they might say, people seem to believe Governor Lincoln Chafee's characterization of himself as a deficit hawk. Indeed, following a press briefing from State Budget Officer Thomas Mullaney, which Ian Donnis mentions here, Ted Nesi put up a post titled "Chafee's budget shrinks Carcieri's long-term deficits." And indeed, although Nesi's accompanying chart shows Chafee's deficits increasing over time, they appear to be about a quarter-billion dollars below what Carcieri predicted for the same years. ... the easiest way to eliminate the deficit isn't through tinkering with revenue and expenditures  it's through healthy economic growth. A growing economy simultaneously boosts tax revenue as employment increases and profits rise while easing demand for social safety-net programs like jobless benefits. In that context, it's worth noting that Governor Carcieri's last five-year forecast assumed "that recovery in the Rhode Island economy does not take hold until FY 2012, while Chafee's version assumes "that recovery in the Rhode Island economy started in FY 2011." Consequently, Chafee assumes revenue growth of 3.1%, while Carcieri's budget forecast put revenue growth at 2.1%. So, some of Chafee's hawkishness is facilitated by a sunnier outlook. Carcieri predicted the income of Rhode Islanders to grow at a rate of 4.1% and employment at 2.3%, while Chafee expects 4.4% income and 2.5% employment growth. 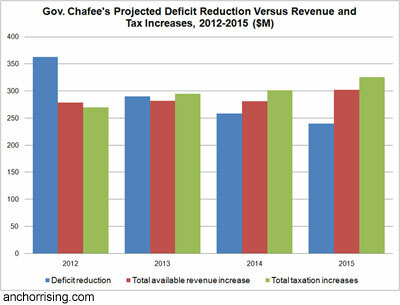 In the first year for which both forecasts offer data, 77% of Chafee's deficit reduction derives from new revenue, 74% from tax increases alone, 61% from a sales and use tax increase. By the end of the four year span, tax increases will represent 136% of the deficit reduction. In other words, our deficit hawk is finding taxpayer money to be such attractive prey that he's using it to grow expenditures, even as he allows deficits to grow year after year. Indeed, over the latter four years of his forecast, Carcieri expected deficits to grow by 48%, while during the latter four hears of his own forecast, Chafee's deficit will grow by 227%. And that's assuming he gets all of the concessions that he's looking for from labor and the General Assembly and that his tax increases perform as well as expected. In summary, Chafee moved the economic recovery up a year and increased taxes, and still his deficits catch up to Carcieri's at a rate of approximately $40 million per year. (The original post was written to explain that supporting high-taxes to pay for high-spending does not make one a fiscal conservative, even though it might help close a deficit).